Having skied at the destination resort of Big Sky for the last decade, our family decided to try something different. Don’t get me wrong- we still love Big Sky Resort with its endless choice of terrain and trails. We ultimately decided to go just one hour north of Big Sky Resort to check out Bozeman’s local ski area at Bridger Bowl. The college town of Bozeman, Montana also has plenty to keep the family entertained with fantastic restaurants, events, museums, and outdoor activities (including some fun sledding hills). Here’s the lowdown on Bridger Bowl: we loved it! Bridger Bowl’s skiable terrain is fairly large at 2,000 acres and offers trails for both beginner, intermediate, and expert. They have an 8 chair lift system and the longest run is 3 miles. We skied for 2 days and found plenty of trails for all abilities. Click to enlarge trail map. Courtesy of www.bridgerbowl.com. Base Map- Courtesy of www.bridgerbowl.com. While our oldest daughter hit the blue diamonds, my youngest daughter and I spent the first part of our visit at their impressive beginner ski area. The “magic carpet” is covered and leads you to the top of the beginner hill or to the Snowflake lift to ski the short and easy Hickey Hollow run. It’s the perfect sequencing of easy and manageable beginner ski terrain and offers the chance to practice getting on and off a chairlift. As a bonus to any parent skiing with young children, you’ll find Snowflake Hut conveniently located right next to the Flurry magic carpet and Snowflake lift. It offers a warm respite with benches, a water fountain, and restrooms when you need a break. After graduating from the beginner area, we also enjoyed the green runs found off the Virginia City and Sunrise lifts. For advanced skiers, you will find more serious terrain by taking the upper chairlifts to both blue and black diamond runs. You can even ski the “Ridge” which is accessed by hiking a few hundred feet above the lift serviced ski runs (avalanche transceiver, partner required). We were there on a Thursday and Friday in early March and encountered lots of deep snow, friendly locals, and no lift lines. Although Bridger Bowl has two “lodges” (Saddle Peak Lodge and nearby Jim Bridger Lodge) located at the base, they only provide dining and skier services and do not offer onsite lodging. Bridger Bowl is located just 16 miles from Bozeman’s Main Street, which is filled with restaurants, shops, and theaters. Just head out of town on Rouse Avenue (which turns into Bridger Canyon Road) and take that straight to the entrance to the ski area. Heads up: We are not sponsored in any way and have never received compensation at the behest of any organization or company. If you book one of our recommended properties from our VRBO or booking.com links, you won’t pay a penny more. Thanks! Disclosure Statement. $63 for adults and $25 for children ages 7-12. And if you’re just learning to ski, it’s only $15 for beginner lifts only (magic carpet and Snowflake lift). Rentals: Skis, boots, and poles: $10 (6 and under), $15 (children), and $30 (adults). Helmet rental is $5. 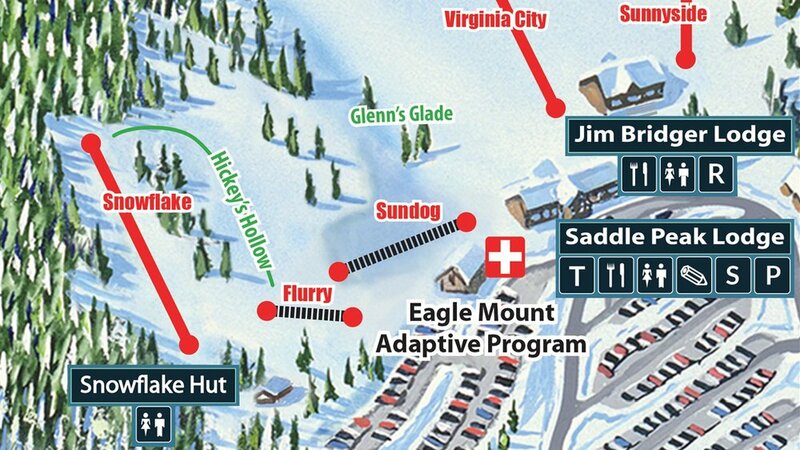 At the base, you’ll find dining in both Saddle Peak Lodge and Jim Bridger Lodge. Both offer a cafeteria-style dining area with plenty of slopeside windows to take in the scenic view of the mountains. Each lodge serves breakfast and lunch (pizza, BBQ, chili, hot dogs, etc.) as well as muffins, chips, yogurt, slushies, --you get the idea. The prices were fairly reasonable for the convenience, and the cafeteria dining area was a pleasant place to relax and watch the skiers glide down the mountain. Jim Bridger Lodge has additional food options with a bar serving gourmet coffee and other adult beverages (beer, wine) as well as Jimmy B’s Bar and Grill which offers table service, a full-service bar, and seating by the only fireplace we could find at the base. If you’re on the mountain, you can stop at Deer Park Chalet and Alpine Cabin for a quick bite. On the way back to Bozeman, be sure to stop by one of our favorite breweries for a tasty beer and a bite to eat. MAP Brewing is a cozy place to hang out with great views, while Mountains Walking Brewery offers fantastic wood-fired pizzas and a Pac-Man video game for the kiddos. Both are excellent stops and offer kids menus as well. Bridger Bowl exceeded our expectations for sure. We loved its relaxed vibe and beautiful mountain scenery and certainly appreciated spending less on lift tickets as compared to Big Sky Resort. And Bozeman is a super fun town with great non-ski activities like sledding hills, the Ellen Theater for a movie, the Museum of the Rockies, and fun shops and restaurants along its charming Main Street. We would love to return!